The first time I had an authentic Mexican taco I’ll admit I was a little skeptical. I had recently transplanted from Massachusetts to Southern California and until that moment I had only eaten tacos sitting down, in crunchy shells and loaded with cheese. Massachusetts has a lot of great food, but Mexican cuisine is not it’s strong suit. I stood in a line of Mexican men at a truck in a parking lot in Bakersfield, CA, using my fractured high school Spanish to navigate the menu while my friend Renee tried her hardest to convince me that these were “real tacos” and that eating from a truck in a parking lot wasn’t going to make me sick. This was 2002 mind you. Gourmet food trucks were nearly a decade from being fashionable. So I ordered an A-Sa-da taco for $1. I looked at this mini disk of corn tortilla with steak, onion, cilantro and salsa on it and furrowed my brow a little. I took a bite. I ordered 3 more when I was finished. By the end of the week I had returned to the truck twice more. So yea. Mexican food is my buddy now. I eat it constantly in the spring and summer. 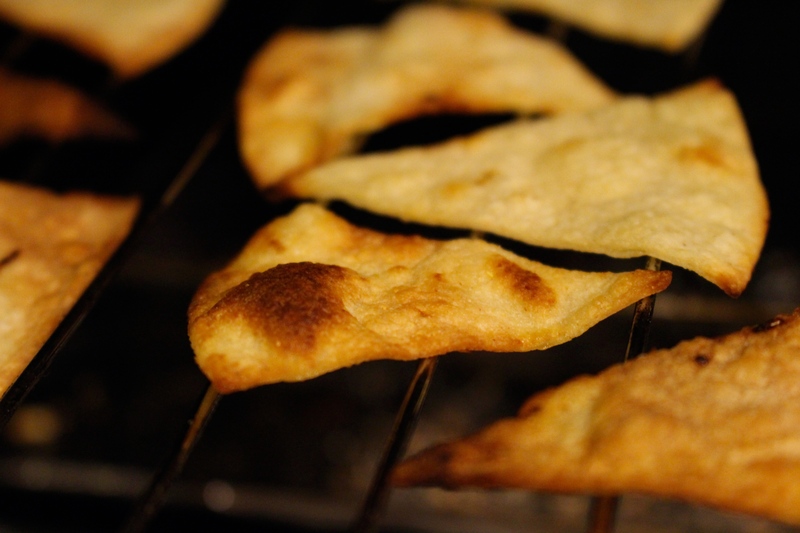 Here’s my take on healthy tortilla chips. A simple snack that tastes great and isn’t loaded with calories and fried oil. 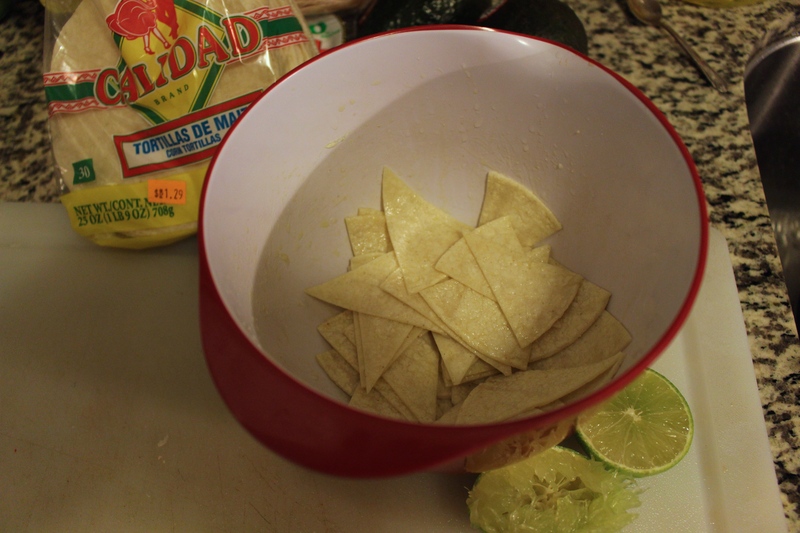 Toss them in oil, sea salt and lime juice. Toast in the toaster oven. 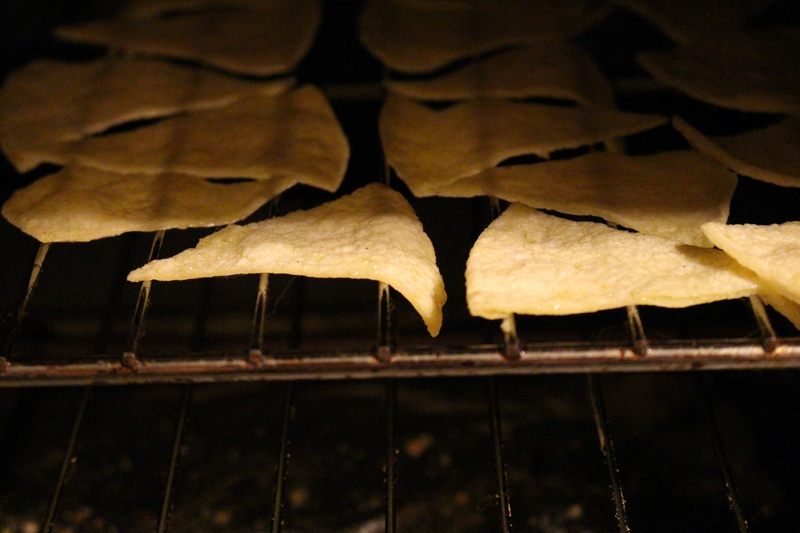 You can broil them or bake on high heat in a conventional oven too. Keep an eye (nose) on them, they turn quick. Maybe 3-5 minutes depending on temperature.